Thanks, you created an amazing getaway! Charming and peaceful place, delicious food, warm and generous hosts – what more could one wish four! A wonderful place to rest and spend the night, delicious breakfast, great company. Thank you so much for your wonderful hospitality – breakfast in our suite was a real treat! It’s so quiet here – best sleep we’ve had in ages – Thanks for everything. Lovely and peaceful. Awesome food and even better company. Plus what B&B has an outdoor hot tub! Definitely return again. Enjoyed the Inn, Super breakfast! Our 50th Anniversary!! Had a wonderful time here. Thank you for your warm hospitality and delicious baked goods! It is absolutely beautiful and romantic here – we love the “Sweetheart Package”. Restfulness awaits you at Inn the Woods. A Bed & Breakfast in Hyde Park, NY. Inn the Woods Bed & Breakfast is centrally located within the “Great Estates” Region and to The Culinary Institute of America (3.5 miles), Walkway-over-the-Hudson (9 miles), Franklin D. Roosevelt’s Home Museum & Presidential Library (2.5 miles), Eleanor Roosevelt’s Val-Kill Home (3.5 miles), Vanderbilt Mansion (1 mile). Discover antiques, trails, pick-your–own orchards, Drive-In movies, wineries, breweries, gardens, Hudson River cruising and the Dutchess County Fair. You can also take a train ride on Metro North (2 hour ride each direction), from the Poughkeepsie station to enjoy all that NY City has to offer. Our Bed & Breakfast has a convenient location while visiting the Colleges of Bard (35 minutes), C.I.A (10 minutes), Marist (15 minutes) and Vassar (25 minutes). Come explore the beautiful Hudson Valley! 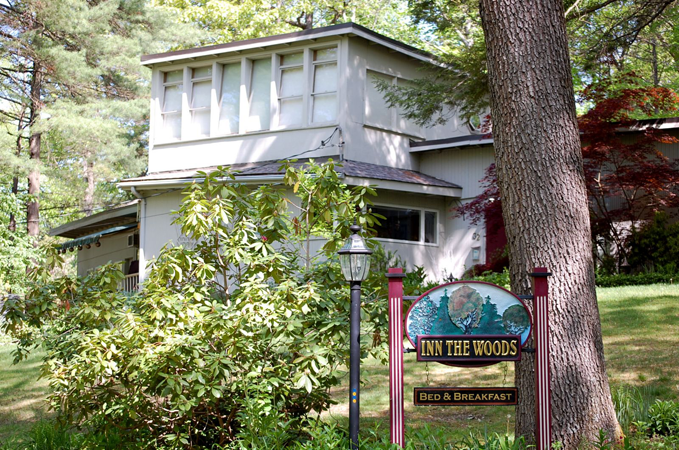 Inn the Woods Bed & Breakfast is a spacious contemporary, in a peaceful wooded setting. It is a place for you to relax all year round. In the morning you will rise to the rich aroma of freshly brewed “Inn the Woods” special blend coffee. Making your way to the sunlit dining room you will find hot beverages and juices set out on the side server. 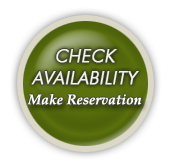 We offer a served, full, single selection breakfast and can accommodate some food allergies, please inquire as to which. On the elegantly set and candle lit table there will be individually plated muffin and scone of the day, your fresh fruit course and one of our homemade jams. With completion of the fruit course breakfast entrée will then be served to you. We incorporate a sampling of the areas fine, organic produce, hormone free dairy & eggs and unique foods in each of our gourmet breakfasts. Guests have found our full breakfast carry them later into the day affording them to continue to enjoy their activities before breaking for or having a stop for lunch. Business travelers or those needing to check-in for flights and print out boarding passes there is a computer, printer and fax for guests use. Whether you choose “Inn the Woods” Bed & Breakfast as a convenient hub, enjoying all that the Hudson Valley has to offer or as a year-round destination unto itself, a restfulness and warm hospitality await you!